If you missed part 1, go here. 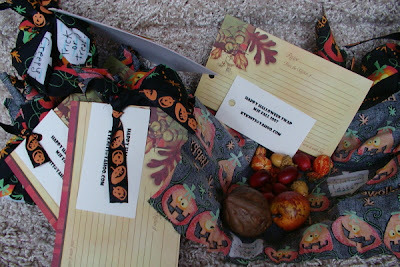 Ktknits swap 2: Recipe cards and gift made of fall/Halloween imitation nuts with scent pellets. 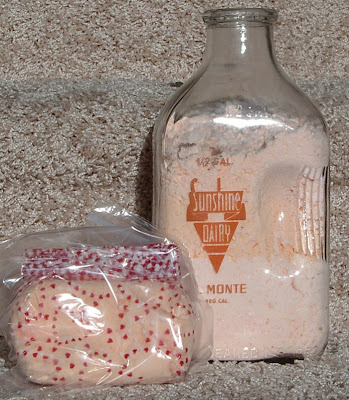 Alee swap 2: Milk bath; comes in the plastic bag with hearts. But I had to put some into a bottle I got from Alee a while back just because the bottle has the name Sunshine on it and is from my home state. Sunshine/daughter swap 2: Knitted boa scarves made on Mattel hand-crank knitting machine. 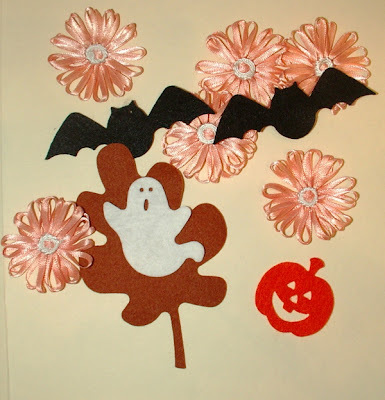 The second item is handmade daisies and die-cut shapes that we punched out. 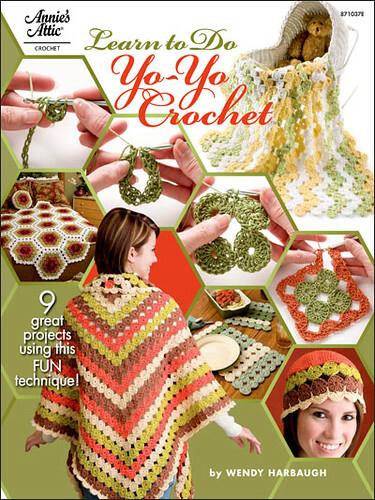 All that is needed is for the recipient to make some yoyos and add these and a few buttons and you have a cute Halloween garland. Or they could make a cute pin or anything else they can think of. 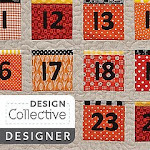 Note each kit is a little: different colors, types and amount of what is in it. 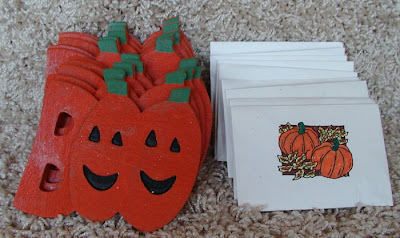 Mkmomus swap 2: Hand-painted door hanger with witch and pumpkin candles. 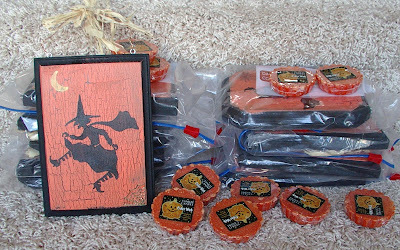 AliShuShu swap 2: Picture frame magnets for refrigerator, post it notes, and a Halloween decorative hanger. 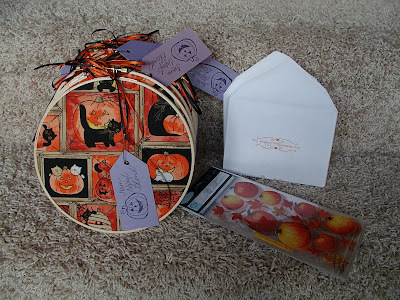 naturecraft swap 2: Decorative fabric in hoops to hang, pumpkin stickers, handmade holiday cards. Mommom swap 2: Hand-painted wood magnets and hand-stamped sachets. 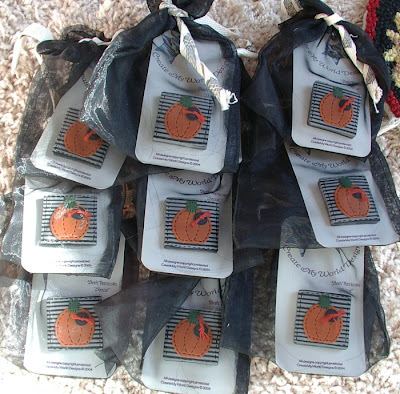 createmyworld swap 2: Hand-made pumpkin pins. 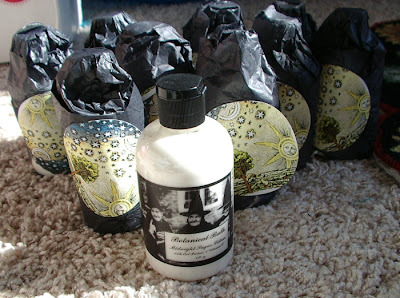 botanical bath swap 2: Hand-made midnight sugar lotion. 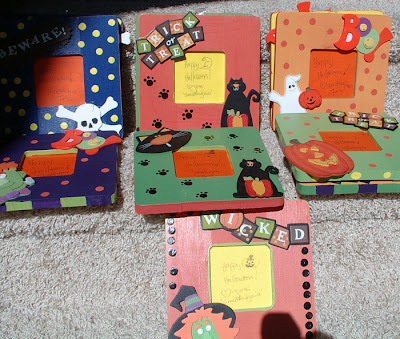 Smoothiejuice swap 2: Hand-painted wood picture frames. Turkish lace hunt HELP PLEASE!! !